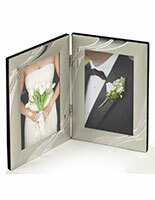 These double 4x6 photo frames are made of durable aluminum with a silver finish. 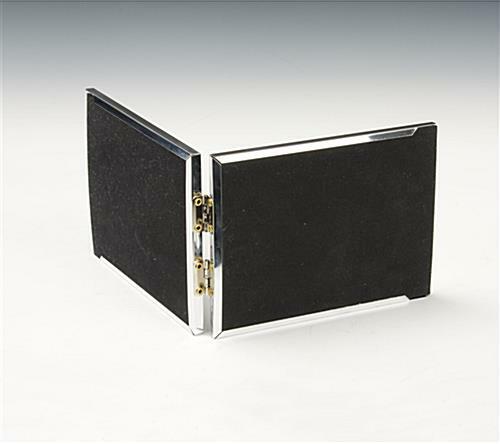 The dual picture holders feature attractive mirror edges that make them stand out. Each of the photo frames sits on tabletops, displaying prints in a landscape orientation. The aluminum holders have (2) slide-in rear backers that make changing inserts easy. The dual picture frames with mirror accents include glass lenses for protecting photographs from dust and moisture. The tabletop displays are also available in a model that holds 5"x7" prints. 15.0" x 5.5" x 0.3125"
7.5" x 5.5" x 0.6875"